Disability, disability culture, and identity politics were just some of the themes and issues celebrated with passion and debated with rigour at the High Beam Festival. This festival offers a rich, colourful and at times, cutting edge program of theatre, music, film, dance and visual arts exploring the theme of disability. High Beam is not concerned with its marginalised status in the broader ‘arts as excellence’ arena, nor the spare seats and low profit outcomes. Its purpose is making the arts accessible to a group often excluded both from the arts and from the means of producing art. The ‘art as therapy’ model, or ‘medical model’ as some people call it, seems no longer acceptable as the modus operandi. While High Beam makes room for such art, its motivation is more closely aligned with a cultural development model that aims for an enriched and inclusive society where disability is not about being on the wrong side of ‘normal’ (as the medical model would have it). On the contrary, ‘coming out’ takes on a whole new meaning both within the festival productions and on the streets. As other minority groups have staked an identity out of oppressive regimes of otherness, people with disabilities are making visible their bodies, identities, ideologies and sexualities, weaving personal narrative into works of theatre, comedy, dance and visual art and evoking new representations that challenge constructions of normalcy. 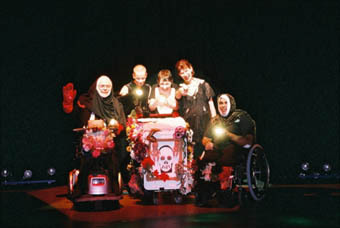 Caca Courage, presented by Access Arts and Queensland Performing Arts Centre, entertains, provokes and challenges the boundaries of ‘normality’. “Caca” is the French word for ‘poo poo’, and this work metaphorically ‘shits’ on the patronising idea that people with disabilities are so, so, courageous. This is achieved through a visually stunning production and a clever series of provocative moves that defamiliarises, in the Brechtian style of ‘alienation’, the ideologies of the ‘normal’ body. Mat Fraser’s Sealboy: Freak moves beyond the personal narrative and juxtaposes 2 characters, one representing the historical genre of human freak show exhibits, and the other a contemporary actor with a disability struggling to eke out a career in the mainstream. Fraser uses the ‘spectacle’ of his body, at the same time as reclaiming the word ‘Freak’ in a deliberate attempt, in his words, “to shock people out of their complacency.” Fraser wonders whether he is in fact only read as a ‘freak that acts’, and not as a talented professional actor. Fraser worries that too often the audience responds with the ‘wow factor’ such as, ‘it’s incredible, what, with him having short arms and everything.’ Fraser’s show is a piece of realism yet he plays with notions of identity via postmodern pastiche, providing both entertainment and witty retort to straight culture through Rap-style music. Aside from the performances—and perhaps more evocative—were the forums, workshops and post-show outings in which performers and artists came together to share conversation over food and wine. Often what goes missing in the reviewing of a production are these everyday spaces and unfolding of ideas. One may well imagine that in the difference of disability lies homogeneity, shared experiences and unifying ideologies. While on some level there is a sense of disability culture, many came to agree that indeed the word ‘culture’ could well be replaced with ‘culture(s)’ to reflect the real and surprising diversity amidst those who identify as people with disabilities. Debate raged over disability politics and the role of the arts. Some argued for the drawing of distinctions between ‘professional performance art’ and that which is described and experienced as ‘therapy.’ Whatever decisions are made for the next High Beam Festival, we can be guaranteed of a radical exposure to culture(s) of disability.